I?ve been anticipating the official announcement of the Apple Watch since rumors surfaced many months ago. ?I?ve spent much time thinking about the features I?d like to see based on my day-to-day routine. ?Since I am an avid runner, my main use cases revolved around what I want related to running; no phone required, GPS built in, great fitness application to track my pace, distance and heart rate built in. ?I didn?t get many of the things I had hoped. I don?t even wear a watch today, except when I run. ?After the Apple announcement of the Watch, I upgraded my running watch since the Apple Watch met almost none of my running needs and wouldn?t be available until 2015. ?The last thing I want to do is run with my new iPhone 6 and a watch. Even with the Watch not meeting my set of requirements, I still want one. I think this is a paradigm shift in how we interact with the world. What we witnessed in the keynote from September 9th introduced a new product platform which will change the future. It?s unlike any wearable to date in the sense that it truly extends the iPhone and delivers only the most important bits of data to the Watch screen. ?It acts as a filter we control, where we determine the notifications and data points most important to us and puts them in a convenient location; right (or left) on our wrist. Today we see many people with their smartphones out everywhere, checking Twitter, Facebook, texts and email. ?Tomorrow we could very well see people quickly checking their watches to view these updates. Less disruptive and much more of our attention. Applications being available the day the Apple Watch is released is important. 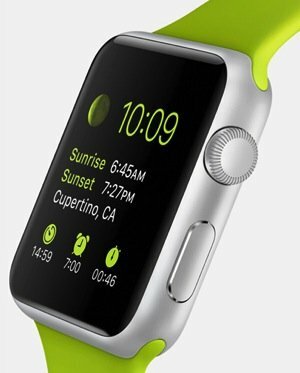 ?There are plenty developers already chomping at the bit to get started with the Watch. These are the developers who will make a difference, have the ideas that will drive the platform into the future.? Jeremy Olson of Tapity is one of the those outspoken developers who has described his vision for using the Watch with their Hours application. The ?Watch takes this to a whole new level. It means you can switch timers without even taking your phone out of your pocket. Just glance at your wrist and tap. Boom. We absolutely cannot wait to start time tracking on the ?Watch and you can bet Hours will be available for ?Watch on day one. For example, my time tracking app Hours could have a unique tap that reminds people every so often that they have a timer running. This kind of notification would be useless on the iPhone because it would result in a lot of obnoxious buzzing that may or may not mean anything related to your time tracking. Jeremy represents exactly what I think the successful applications on the Watch will be. Small windows into their bigger apps with a small subset of features. Perfect for a watch. I don?t think there will be an Apple Watch Store, but rather applications for the watch will be an extension of applications we already have on our phones. ?Just the way we now have app extension in iOS 8. Developers are the ones who are going to make or break this device. Creatives will be the ones who see the potential and extend the great ecosystem we have in the Apple App Store today. Apple will need to get a Watch SDK and devices to developers long before a release. ?I?m hoping for a Watch Kit that will give us a device and all documentation to start creating this next generation of applications. If we don?t get these kits then applications will only be from Apple and key partners at first. The Apple Watch represents the future. ?We are all bombarded with data looking for our attention everyday and when we look to our phones it can be overwhelming where to turn our attention. A device like the Apple Watch will help filter out the noise and focus our attention to what we feel is important. Developers who get this will be the successful ones on this platform and help guide others. I?m excited to see what comes to the Watch.